I don't know about you but before I tackle the boring have-to's of my day I will make any excuse to get crafty. This project is a great way to delay the tasks at hand and be productive at the same time. 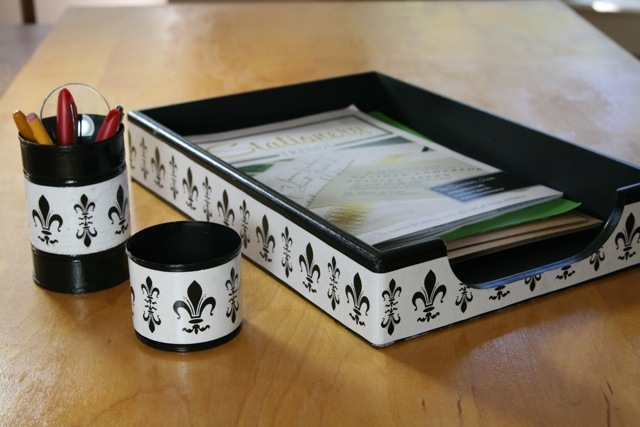 All you need is a can of black spray paint and our Fleurs de Lis tape and storage containers of your choice. Besides being the symbol for French royalty, fleur de lis also means flower of the lily or lotus. Now that my desk accessories are perfectly coordinated I can get some work done in my très organized office.